Ljubco Georgievski graduated at the Philological Faculty in Skopje, at the Comparative Literature Department. 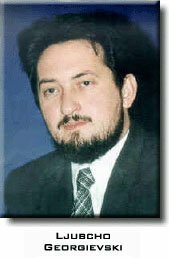 Ljubco Georgievski was appointed Prime Minister of the Government of the Republic of Macedonia on 30.11.1998 and his mandate ended on 15.09.2002. After the President of the Republic of Macedonia, Boris Trajkovski presented him the mandate, Ljubco Georgievski was re-elected President of the Government of the Republic of Macedonia on 27.12.1999. Ljubco Georgievski has been on the function President of VMRO - DPMNE from the very beginning. Ljubco Georgievski is an author of three books: the poetry books "Apocalypse" and "City" and "Direct interventions with short stories into the anatomic structure of history" - short fiction.